First, we want to thank you for your interest in becoming a volunteer driver with Daniel’s Care Van. Our brave riders and their families depend on us to get to their life-saving appointments, and it’s an honor for us to serve each and every one of them. Second, thank you for your support of our founder, Jeri Jones, as she faces her own treatment for breast cancer. Her surgery is scheduled for Tuesday, August 15. Although we don’t know exactly what to expect in terms of recovery, right now we’re trying to get coverage for kiddos from August 7th through September 1st. That’s where you come in! Sometimes, we know our riders’ appointments ahead of time, and sometimes we don’t. Because the business of treatment for our brave kiddos can be very unpredictable, we’re setting up an “on call” system for our team of volunteer drivers. We do not drive kids every day, but to support our mission, we need to be prepared to drive kids every day. To that end, we’re looking to you all to sign up for full days where you will be the designated on-call driver. What a whirlwind the month of July was for us here at at Daniel’s Care Van. On July 8th, we had a very successful First Annual Kickball Tournament. The love shown for our mission was truly overwhelming and we are extremely grateful to everyone who participated, donated, and helped us make it a success. More recently, we were taken in a completely different direction with the news that our founder is facing treatment for breast cancer. We have been again overwhelmed by support from our DCV community, and we can’t thank you all enough. 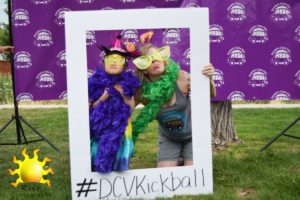 We want to extend a huge thank you to everyone who participated in our first annual Kickball Tournament and Family Fun Carnival. Because of the support of our sponsors, participants, and donors, the event was a great success. We exceeded our fundraising goal by over $1,000! We want to thank each and every one of you for your support – you truly are Transporting the Brave. We hope to see you again next year! 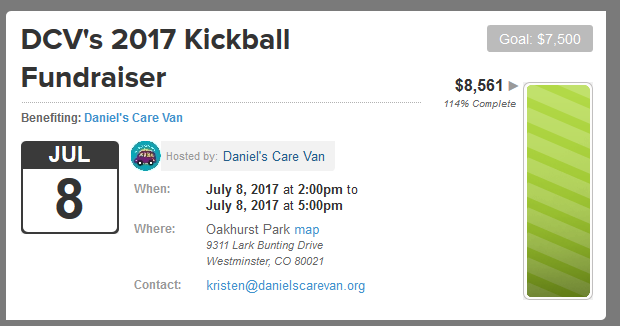 We are so excited about our First Annual Kickball Tournament this weekend, July 8th! Thank you to everyone who has signed up to play, volunteered to help, or donated to the event. 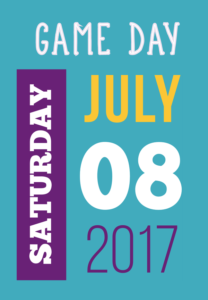 We can’t wait to see so many of you on Saturday to thank you in person. See below or visit our site for more information — hope to see you there!